Warmer days means more time outdoors. It also means everything outdoors begins to grow and thrive after being dormant all winter. As a homeowner, one of the most important aspects of your home is the lawn that surrounds it. Growing up, a flourishing lawn was a symbol of pride and prosperity that one could echo throughout the neighborhood. A good lawn is a place where your kids can play outside, you can host family BBQs, and relax under the stars on a nice summer night. Like coffee in the morning, it’s something every homeowner has to have more than anything else. 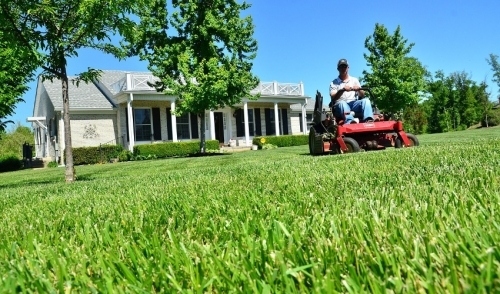 To achieve a green, lush lawn this year follow these spring lawn care tips to set yourself up for success in the months to come. For starters, winter is not friendly to the soil of your lawn. Neither is the salt or ice melt you might have used throughout the colder season. All of these factors can alter the pH of your soil, compact the soil, and create the type of conditions that make your lawn more susceptible to weeds. Take on the side effects of winter and attack them head on by thoroughly raking your lawn to dethatch all of the dead grass and leaves that have built up. Raking will create the canvas that will allow for new blades of grass to grow and will also help nutrients penetrate your soil. Following dethatching the grass, grab an aerator and use it across your entire lawn. Aerating helps break up any compaction by making little holes in the lawn so that oxygen gets to the roots of the soil allowing it to breathe. If you notice that bare spots have formed in your lawn, utilize a soil conditioner and overseed the areas that need attention. Once you’ve established the proper canvas for grass to grow and thrive, encourage the growth of your lawn by applying the right combination of fertilizers and herbicides. These will help control the impact of weeds and insects while supplying your lawn with the nutrients it needs. Be cautious of which fertilizer you use and when you use it as in some cases fertilizer can do more harm than good. Proper fertilization typically happens on a schedule meaning if you fertilized your lawn in the late fall, you most likely don’t need to early spring. If this is you, then it might be more suitable to focus on weed control than supplementing your lawn with additional nutrients. If your lawn has not been fertilized in some time, I recommend spreading a slow-release nitrogen fertilizer early in the season every 1,000 square feet to maximize yield. One important tip is to not use herbicide if you’re trying to grow new grass from seeds as the herbicide can prevent the seeds from germinating. In most cases, herbicide can be used for spot treatments to resolve isolated problems in your lawn. Feel free to use the mulch function on your lawn mower to give your lawn a boost of organic nutrients as well. Lastly, don’t forget to tune up any yard equipment, check irrigation systems if you have them, and replace any tools or equipment that may be unusable. Allow the hums of the mowers and edgers around the neighborhood to move you in the direction of a green lawn. Everyone’s lawn is different and comes with its own unique set of circumstances. Evaluate the status of your grass and follow these spring lawn care tips as needed to achieve a healthy lawn all season. © 2019 Taylor Rental Great Barrington, MA. All rights reserved.